During the day, attractions Kuta Beach in Bali is very hot by the sun. Hot on the beach can burn the skin. That's because Bali is located in the tropics, is also a matter of course that the beach is very hot during the day. Attractions of Kuta Beach Bali, Indonesia, has two distinct parts, heat and cool during the day. Maybe you will be confused by this, but it is a reality. Attractions of Kuta Beach has two different sections during the day, unconscious but can be felt by the real. Heat and cold are two vastly different things. The area near the sea is a very hot during the day. In this section there is no shade, no trees, although the sea water is very with, but the heat of the sun can be felt with the real. Heat from the sun is great for sun bathing, but not recommended done during the day, when the heat of the sun is very high. Can burn the skin if not using sunblock. Farthest part of the sea water is a cool place. Because, in the Kuta Beach there are many shade plants that can be used to shade and relax by the tourists. These trees are very useful during the day. The trees on the edge of Kuta Beach used to sell the place, a place to relax, a place to rest. Cool air coming from the wind that blows from the sea, containing water vapor, so that the wind was cool and fresh. 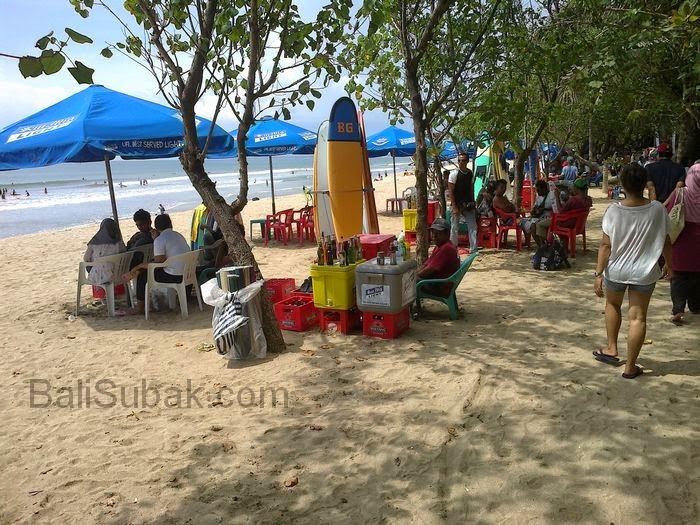 Attractions of Kuta Beach is very crowded during the holiday season. Many tourists who visit during the day will take shelter under a shade tree on the beach. Are Some tourists will walk on the beach closer to the sea. Soaking the feet in sea water so that the heat is felt will disappear. Under the shade trees attractions of Kuta Beach as a market. There are many traders and shelter. Dealer drinks, clothes, souvenirs, and so on. These traders from various districts. 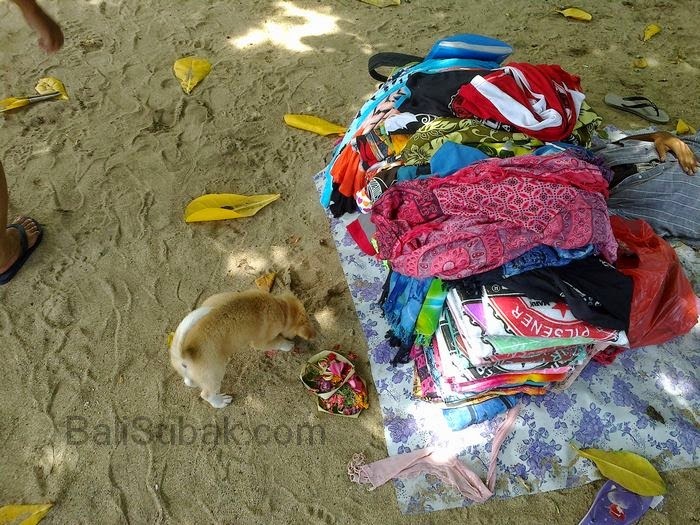 They came to Kuta to sell. Because selling is the easiest way to earn money. Kuta Beach is great for surfing. Under the shade trees there are many people who can help the beginners to surf. There are also rental surfboards at relatively cheap prices. But for foreign tourists, the price is more expensive to rent a surfboard. The more the afternoon, the temperature difference in Kuta Beach, between the shade with terdepat area with sea water, do not differ much. Because the sun had started to disappear and become sunset. The temperature of all regions and nearly equal parts. Cool and fresh is the air temperature during the afternoon at Kuta Beach. People spend more time near the sea. Children and the god of water play during the afternoon. The surfers increasingly rarely seen during the afternoon. Most surfers will enjoy the sunset during the afternoon. Attractions of Kuta Beach is famous with the sunset in the afternoon. Pada tahun 1981 saya menemukan diri di Indonesia selama tiga bulan untuk bekerja. Saya adalah seorang tamu di akademi kepolisian di Bandung buat mengurus pendidikan lalu lintas. Juga saya ada di Bali beberapa hari di sebuah hotel untuk perwira militer di Kuta. Pantai Kuta ,juga Pulau Bali saya mengalami sebagai semacam surga. Kolonel Sugito bersama saya pergi ke interior Bali, telah di tempat yang dimana turis tak pernah benar-benar datang.